In 2011, my mum and I spent a week in the beautiful city of Barcelona and had a blast! One of the places we ventured to was La Rambla. La Rambla is a 1.2km long street in central Barcelona that stretches from Plaça de Catalunya to the Christopher Columbus Monument at Port Vell. Nope. My mum and I didn’t walk the entire stretch. Pity. I would have loved to make the trip all the way down to the Port. However, we only walked from where the Barri Gòtic meets La Ramla back to Plaça de Catalunya. But one day, I will return to the beautiful city of Barcelona and I will make it all the way to Port Vell! The sale of animals there are now banned though. And just before my mum and I visited Barcelona, bullfighting was banned. In fact, the caged animals remind me of the animals sold at Bangkok’s Chatuchak’s Weekend Market as well. 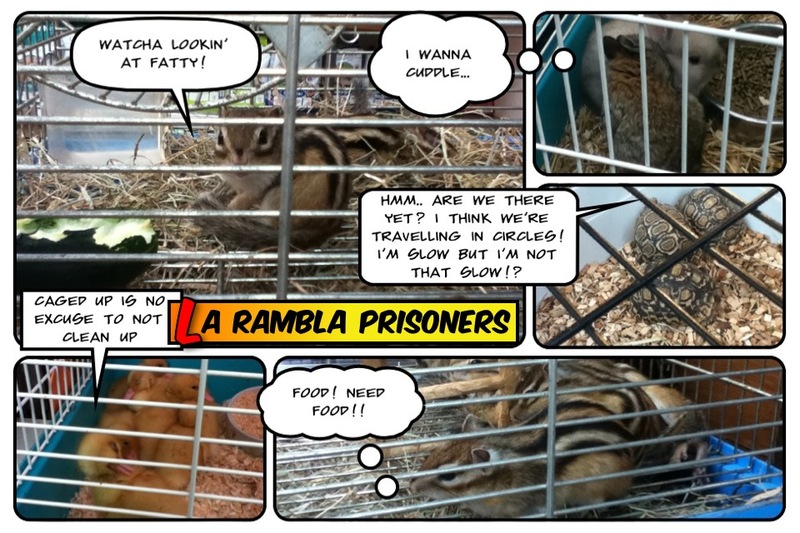 Hmm… I just realised my most recent Bali comic strip was also created using photographs of animals. Anyway, I hope you enjoyed the comic strip and stay tuned for future installments of The SIA Brat Comic Strip!